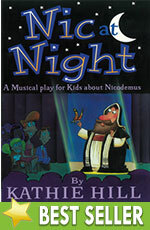 Nic at Night Easter : Kathie Hill Music, LLC, Making music with and for kids for over 25 years! This delightful play-within-a-play cleverly weaves the Gospel of John account of Nicodemus with the mystery of rebirth and renewal. Discover the mystery! Nic at Night includes the resurrection medley "The First Lord’s Day" making it perfect for Easter or anytime you want to creatively share the plan of salvation. This musical clearly shares the gospel in a creative and relevant manner. It is a MUST for every choir to share at Easter or anytime! This musical is a big hit every time we perform it. Have had students accept Christ as their Savior during rehearsal after discussing being "born again" and the butterfly example for the Father, Son and Holy Spirit. Can I have another favorite? Highlighted in my memories are the white gloves and black light movements. The smoke and "Secret Disciples" dance was coveted by our 8th grade boys. As always the lyrics and easy to learn tunes made this musical difficult to put into storage after we were done. The message was clearly there and so delightful to present. A downloaded file of a Spanish translation of the script and song lyrics in PDF format. Each 1x license permits you to make 15 copies of the PDF files to share with those in your church or organization only.